If you know me, you know that I absolutely, positively love cheesecake. 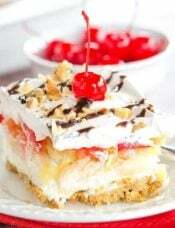 Cheesecake anything. Cheesecake everything. I have sampled countless different varieties of cheesecake from The Cheesecake Factory, and I always come back to the Oreo cheesecake. I love many of them, but I’m such a kid when it comes to Oreos and I totally adore them in my cheesecake. I even made myself an Oreo Cheesecake for my birthday a few years back. So when I saw these cookies – essentially a cheesecake with mini chocolate chips, and rolled in Oreo crumbs – they were calling my name! 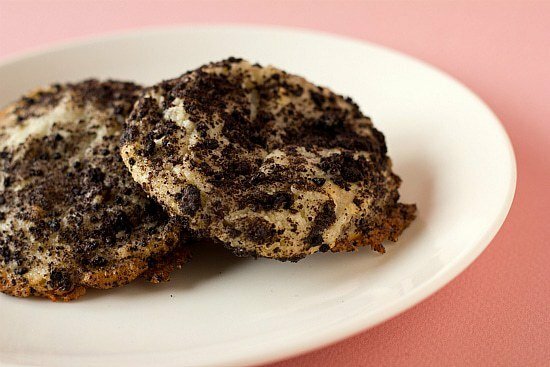 If you love cheesecake and/or Oreos, you will totally adore these cookies! Chocolate cheesecake in cookie form! 1. 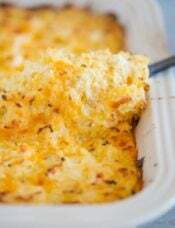 Preheat oven to 375 degrees F. Line a baking sheet with parchment paper and set aside. 2. In a mixing bowl, cream together the butter and cream cheese on medium speed until smooth and well-combined. 3. Add the sugar and vanilla extract and mix until the ingredients are well-combined. Add the flour and mix on low until the flour is incorporated. Stir in the mini chocolate chips with a rubber spatula. 4. Place the Oreo cookie crumbs in a small bowl. Scoop the cookies into about 1½ to 2" balls and then roll in the cookie crumbs. Place the cookie balls on the baking sheet. Bake for 12 to 15 minutes, or until the edges are golden and the tops are slightly puffed. 5. Cool on the pan for 2 minutes before transferring to a wire rack to cool completely. Store in an airtight container. these were amazing… they tasted like mini cheesecakes but less of a hassle.. so good!! Hi! Can I chill or freeze this before I bake them? Hi Mia, You can chill the dough or freeze the shaped dough balls. Made these a couple times for kids’ birthdays. Put it out and gone the next minute with them looking for more! 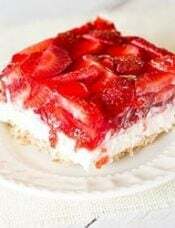 Wonderful, tasty, and easy recipe~ Thank you! Hi Raul, You don’t want to bake too much longer or they’ll burn, but you could try increasing the sugar and/or the flour. Hi! This looks delicious! Do you know how adaptable it would be for pumpkin cheesecake and coated with graham cracker crumbs or something? How much pumpkin puree would I have to put in there? Hi Annie, Great idea! I’ve never played around with subbing pumpkin into these cookies, so unfortunately I couldn’t say how much you should use. Let me know how they turn out! Hello, I tried making these cookies and they didn’t spread! Although they tasted good, they kind of looked and felt like rocks – please help! 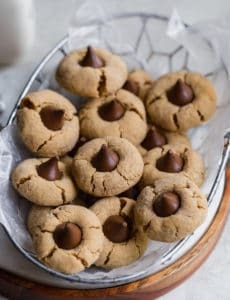 Is it possible to make this without the chocolate chips? Or would I have to double something in the recipe to compensate for the lack of chips in the dough? Hi Niq, You can omit the chocolate chips without altering the recipe. Made this the 1st time the other day and it was really good! But… I feel like it was missing something. I was looking for a tiny bit saltiness to it and realized the recipe called for unsalted butter and didn’t ask for salt at all! And so I made another batch today and doubled the most ingredients except the cream cheese, I used the whole 8 oz then added 1 egg. The egg I added since the original recipe was a little bit too crunchy for me. And so this helped in making it a little bit softer. Hi Michelle, I’m a novice and thought I try these cookies. They came out too buttery. I think it’s because I didn’t use enough cream cheese. But how much is 3oz in cups or Tbsp? I googled this and got conflicting information, from 6 to 9Tbsp=3oz. If you could please help me out appreciate!!! Hi Nav, If you have a brick of cream cheese, the wrapper should mark off the ounces, and you can use that as a guide. If you have a tub, you would need to weigh it for an accurate amount. I got into baking cookies a few years ago and started off doing the simple stuff… Mostly just your standard, classic chocolate chip cookies and snicker doodles. Nothing ever too fancy. I wanted to be able to perfect the simple recipes first before I progressed into anything more difficult. The only problem was I could only find things the were way too simple, or the exact opposite in a very demanding and time consuming recipe! Then a few months back I fell on this gem of a website… Your website. 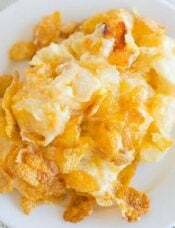 You have found every recipe from simple classics, to out of the ordinary, amazing, beautiful concoctions! And the fact that you put all of them in one convenient place makes looking for great cookies such a pleasant wonderful experience. 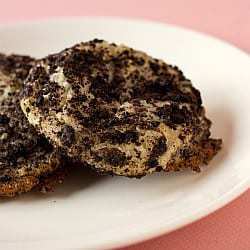 I just fell upon this recipe that puts two of my favorite things in the whole world together into a delicious cookie! Oreo’s and cheesecake make for one of the greatest combinations known to any. 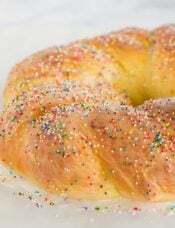 I am going to be making a double batch of these for the people that I work with for much of the staff is celebrating birthdays over this week. I just wanted to personally write a note to say thank you for putting so much time into this website! Finding all these amazing baked goods and sharing them with the world in one easy to find resource… Any time I want to find any type of sweet (heck, any recipe for that matter) this is the first place that I am going to look! I was so excited to try this, did everything that was instructed, and they burned. 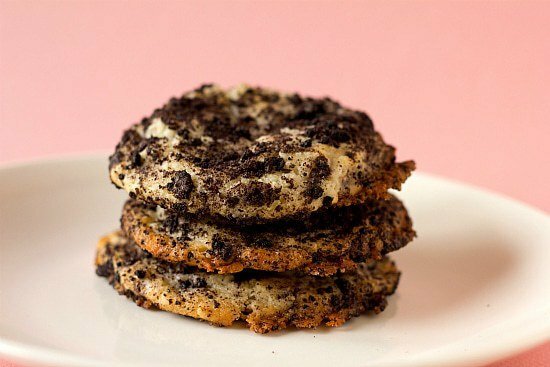 You mentioned rolling the dough in the crumbs, but your pictures look like you just sprinkled the Oreos. Is it because my dough is covered with oreos it burned? My mouth is watering! That is some cookies! Sounds yummy! Hi Elizabeth, If you haven’t made any changes to the recipe at all, and you were having success initially, there might be an issue with your oven temperature. I would look into an oven thermometer to ensure it’s reading correctly. 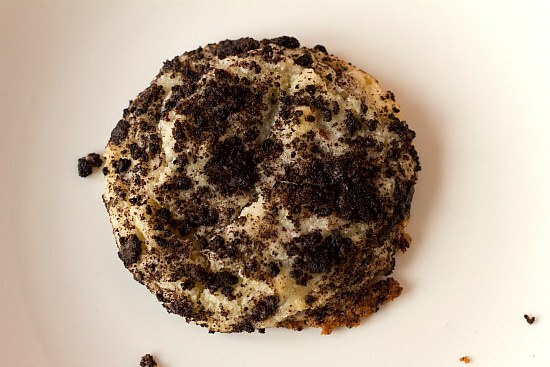 On the Oreo crumbles, is it the entire cookie with the cream center or just the outsides? Hi Melanie, The entire cookie. This was also my question so thanks! Noooo!!! I added a bit too much flour and now they’re ruined. They don’t taste horrible, but are like biscuits and not gooey at all. Also, I rolled too much Oreo crumbs on to the cookies so they looked even more burnt than they were. What consistency is the batter supposed to be? Are they supposed to flatten out by themselves without me flattening them? I won’t be able to sell them at my school fair tomorrow… And who’s gonna eat all these cookies, with my family and I on a diet? I hate to throw them all away when they don’t taste that bad, but I don’t think anyone else would want to eat them looking like that. Oh well, I’ll try again next time! How large are the Baked cookies? I’d estimate about 3 inches in diameter. Thanks! I’ve always wanted to make these and now I’ve got a reason to (I have a school fair tomorrow)! Also I have a pack of Oreos that my family and I can’t eat because we’re on a diet, so this is a great way to use them up! These taste like just what they are and that makes them one of my hubby’s favorites. Thanks for sharing the love! These are so unique and I liked them a lot. 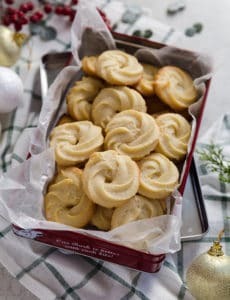 However, I would suggest adding half a teaspoon of salt to these cookies and using a bit less sugar. I felt they could use it because they were a bit too sweet for me. Maybe I’d add more cream cheese as well. 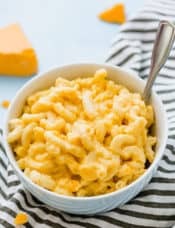 Hi :) Would it be okay if I bake this in a toaster oven? Hi Pat, I’ve never baked anything in a toaster oven, so I’m not sure how it would work. If you give it a try, let me know how it goes! Yes – you can always bake in a Toaster Oven, it will take MANY batches (put the dough balls in the fridge between batches) though. We love to keep single servings of dough portioned out to make fresh warm gooey cookies whenever we need them! Hi, I made these once for my boyfriend’s family and they loved them!! I’m my own worst critic when I say they weren’t fluffy enough. They were thin and not too soft. Any suggestions? Hi thank you for sharing this…I’m really a cheesecake monster and my daughter is an oreo lover. baking it for the first time, it turn out perfectly. super yummy! Hi. 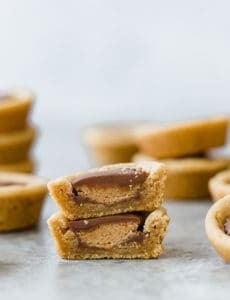 I want to make these cookies so bad but i have a problem with the measurements. Will i double up this recipenif i would use 8oz of cream cheese? Hi Nics, You would be more than doubling the recipe if you used 8 ounces since the recipe calls for 3 ounces. Be sure to scale all of the other ingredients accordingly. Hi. I only have microwave oven here at home. Is it okay to still bake it and use microwave oven? I’m afraid to try on baking it ’cause it might flop if I’ll use the microwave. And if it’s okay to use microwave how long should I bake it? PLEASE I NEED AN ANSWER FROM ANYONE HERE, PLEASE. I do not recommend baking in a microwave oven, the cookies will definitely not turn out.